Thanks to the Columbia City Post & Mail for this feature on the new book! 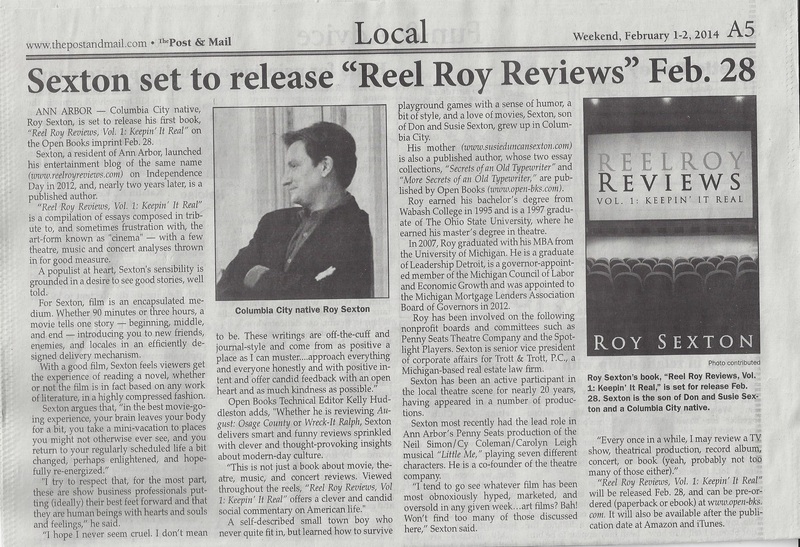 Ann Arbor, Michigan – Roy Sexton’s first book Reel Roy Reviews, Vol. 1: Keepin’ It Real is set for release on the Open Books imprint February 28, 2014. Sexton, a resident of Saline/Ann Arbor, launched his entertainment blog of the same name (www.reelroyreviews.com) on Independence Day in 2012 and, nearly two years later, is a published author. Reel Roy Reviews, Vol. 1: Keepin’ It Real is a compilation of essays composed in tribute to (and sometimes frustration with) the art-form known as “cinema” —with a few theatre, music, and concert analyses thrown in for good measure. As a populist at heart, Sexton’s sensibility is grounded in a desire to see good stories, well told. For Sexton, film is an encapsulated medium. Whether 90 minutes or three hours, a movie tells one story—beginning, middle, and end—introducing you to new friends, enemies, and locales in an efficiently designed delivery mechanism. With a good film, Sexton feels you get the experience of reading a novel (whether or not the film is in fact based on any work of literature) in a highly compressed fashion. Sexton argues that, in the best movie-going experience, your brain leaves your body for a bit, you take a mini-vacation to places you might not otherwise ever see, and you return to your regularly scheduled life a bit changed, perhaps enlightened, and hopefully re-energized. A self-described small town boy who never quite fit in but learned how to survive playground games with a sense of humor, a bit of style, and a love of movies, Sexton, son of Don and Susie Sexton, grew up in Columbia City, Indiana. His mother (www.susieduncansexton.com) is also a published author, whose two essay collections Secrets of an Old Typewriter and More Secrets of an Old Typewriter, are published by Open Books (www.open-bks.com). Roy earned his Bachelor’s degree from Wabash College in 1995 and is a 1997 graduate of The Ohio State University, where he earned his Master’s degree in Theatre. In 2007, Roy graduated with his MBA from the University of Michigan. He is a graduate of Leadership Detroit, is a governor-appointed member of the Michigan Council of Labor and Economic Growth and was appointed to the Michigan Mortgage Lenders Association Board of Governors in 2012. Roy has been involved on the following nonprofit boards and committees: First Step, Michigan Quality Council, National MS Society, ASPCA, Wabash College Southeast Michigan Alumni Association, Penny Seats Theatre Company and the Spotlight Players. Sexton is Senior Vice President of Corporate Affairs for Trott & Trott, P.C., a Farmington Hills, Mich.-based real estate law firm. Sexton has been an active participant in the local theatre scene for nearly twenty years, having appeared in a number of productions. Sexton most recently had the lead role in Ann Arbor’s Penny Seats production of the Neil Simon/Cy Coleman/Carolyn Leigh musical Little Me, playing seven different characters. He is a co-founder of the theatre company. He was featured as Professor Callahan in Legally Blonde the Musical at Farmington Players, and he played Georg Nowack in She Loves Me with The Penny Seats. He has also appeared in Goodnight Desdemona (Good Morning Juliet), What Corbin Knew, Oklahoma!, The Pajama Game, Company, Bells are Ringing, Rags, Side by Side by Sondheim, The Taming of the Shrew, Fiddler on the Roof, The Fantasticks, The Merry Wives of Windsor, Ah, Wilderness!, God’s Country, The American Clock, As You Like It, Tartuffe, The Battle of Shallowford, Trout, and The Merchant of Venice. He is also an active cabaret performer. Sexton notes, “I tend to go see whatever film has been most obnoxiously hyped, marketed, and oversold in any given week…art films? Bah! Won’t find too many of those discussed here. And every once in a while, I may review a TV show, theatrical production, record album, concert, or book (yeah, probably not too many of those either).” Reel Roy Reviews, Vol. 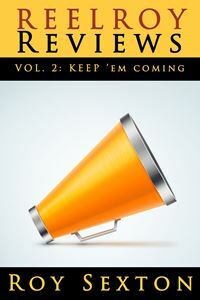 1: Keepin’ It Real will be released on February 28, 2014 and can be pre-ordered (paperback or ebook) at www.open-bks.com. It will also be available after the publication date at Amazon and iTunes. I love this….native son! You are a native son!!!!! About time!!!! Even though you were born in another county! Bless their hearts! A HOOSIER IS A HOOSIER IS A HOOSIER after all! thank you, Susie! your love and support means the world to me! Great article for a home town boy grown up. I am so proud of you Roy and I appreciate your friendship.